While it can be tempting to install cheap copper sinks in your bathroom or kitchen, be aware that they may be more work than you bargained for. 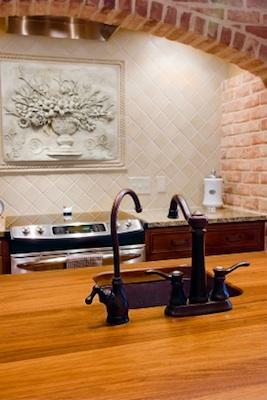 Nearly every copper sink on the market has been hand-formed or handmade to some degree. From true artisan companies such as Stone Forest, to cheap copper sinks made in countries such as Mexico, these products show the work of the artisan in many ways. While many types of metal and metal products have regulations on them to maintain a level of quality, copper sinks do not. What this means is that a copper sink, particularly one that is handmade, does not have to be a specific thickness, regular size or finish. In fact, many inexpensive copper sinks have irregularly shaped rims, are made of extremely thin sheet copper which can wear out over time and have a higher level of maintenance than their more expensive counterparts. Copper is a rich, red tinted metal which ages, darkens and patinas over time. Any bathroom or kitchen product made of copper is said to have what is called a "living finish", meaning that the finish of your copper product is meant to change with use. This means brightly finished copper sinks will darken, antiqued sinks will begin to verdigris and products that are touched frequently will lighten and brighten in color. Most copper products are sealed at the factory to help preserve the finish you purchase it with. Light coats of carnauba wax are rubbed and buffed into the surface of your faucet or sink to freeze the finish where it is. Care instructions should accompany the product, which recommend that you wax the copper regularly, refrain from using harsh chemical cleansers and dry the item after each use. Cheap copper sinks, among other inexpensive copper products, are frequently shipped without this initial protective coating. This means your sink is more likely to age, darken, verdigris or change far more quickly than you may have bargained for. If you choose to use a copper sink that is low-priced and of unknown origin, there are ways you can help to care for it and even out some irregularities. If the sink is an undermount or drop in model and the rim is wavy or uneven, you can straighten it out yourself. Place the sink rim side down on a towel or blanket. Use a leather covered mallet to beat the edge of the rim evenly all the way around until the sink lays completely flush to the flat surface all the way around. Do not use a metal hammer or hit the sink while it rests on a hard surface to avoid getting chase marks in the metal. Frequently, the hole cut in the bottom of the sink for the drain to sit in is wavy or uneven in some cheaper copper sinks. Rather than beat the irregularities out, purchase a piece of thick, soft foam and cut it into the shape of a ring the size of the drain opening. Place it in the bottom of the sink, put the drain on top of it, and tighten it down as firmly as you can from below. This will allow the drain to sit evenly without gaps and leaks at the bottom of the sink. If you are unsure if your sink was factory sealed, purchase a small jar of beeswax and one of old-fashioned furniture polish. Use a soft cloth and work a layer of beeswax into the copper in a circular motion. This will freeze the finish of the sink where it is at that time. Clean the sink using old-fashioned furniture polish to give it a light layer of protection every time you clean. Do not allow water to sit in the sink, instead, wipe it out with a soft cloth after every use. While cheaper copper sinks may be appealing when you compare their price tag with some artisan made sinks, you will need to put in the extra elbow grease to make up the difference. Only you can decide if this is a deal worth taking.